Last December the results of the "Downtown Tulsa Intensive-Level Historic Resources Survey" were published. In plain English that means an inventory of Tulsa's downtown architecture. 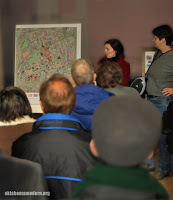 The purpose of the survey project was to document all properties inside the IDL in order to identify which portions of downtown are eligible for listing in the National Register of Historic Places, which would in turn make the properties eligible for Historic Rehabilitation Tax Credit incentives. The final document identifies 88 structures that merit acknowledgment for their historic status. It also lists fourteen districts that deserve recognition for their concentration of notable buildings. For us mid-mod fans who typically see our favorite buildings take a backseat to Tulsa's deco skyline, there is good news in this survey. After perusing the report I found several mentions of Tulsa's modern and recent-past architecture. Many of the buildings identified as Individually Eligible Resources (listed in Appendix A) were built in the Fifties and Sixties. These documents are typically pretty dry reading, and this one is no exception. But it's also crammed with interesting tidbits of Tulsa history. In my opinion it's worth a look for anyone interested in Tulsa's origins or central business district. See for yourself- you can download the complete document here. I'm going to review some of the structures on this list for future articles. For now I wanted to mention one of the highlights of the survey- an area identified as a historic district, that most people don't consider terribly historic. One of the most notable sections deals with the historic value of the oft-maligned central plaza of Tulsa's city and county government. The survey identifies this district as twelve square blocks between Denver and Houston Avenues. Recent attempts were made to entice development of the plaza as a "convention center hotel" complex. There were no takers. And even more disturbing was the assumption that any development would mean immediate destruction of the existing buildings. The origins of this complex date back to a plan drafted in the Twenties. Again in 1943 a committee proposed a city-county-civic center and even suggested including a heliport! But it wasn't until the Fifties when things really got rolling. The first building completed was the courthouse in 1955. But it would take several years and three public votes before the rest of the complex would be completed. 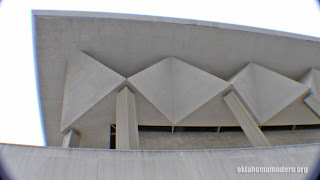 The Assembly Center (now known as Convention Center), City Hall, City Council Chambers, Police Courts, Central Library buildings and the plaza itself were built over the next twenty years and designed by a group of local architects led by Robert Lawton Jones. This group approach explains the diversity of design one sees today- from the Assembly Center's Brutalism in raw concrete (above) to the flowing modernist lines of Central Library. This type of development was common across America in the Sixties and Seventies. The large open plaza, along with "malling" Tulsa's Main Street, were products of Urban Renewal in action. Unfortunately, these attempts to create a relevant public space and retain the validity of downtown were in vain. Much larger forces were already working against any such effort. The draw of the suburban shopping mall had already captivated the American public, and no public building project was going to reverse it. But historical relevance is not reserved for the successful. As Derek Lee, curator for the Tulsa Foundation for Architecture, put it, "Whether you like the building(s) or not, they are a part of Tulsa's architectural history and we would lose a significant piece of history if the(se) building were demolished." I happen to like several of these buildings. Even if the complex as a whole is considered by many as a concrete Spruce Goose.